“The dame in the black dress took a last drag against her rouged red lips, finished her drink, took the cigarette from its holder and stubbed it in the ash tray before making her way to the door. She opened it, stepping into the cold night. As the smoke curled up from the crushed lipstick stained cigarette into the thick air of the seedy bar, it also left the barrel of a tightly gripped .45, and the lady drew her last breath against the cold concrete of this dirty town.” Narrates our disillusioned alcoholic anti-hero in low mono tones. It’s possible I got carried away there, but that is the sort of monologue that runs through my head listening to the Doom Jazz bands, ‘Piano Nights’, sombre but eloquent opening track; the low vibrating crackle of highly sensitive condensers crackling like old vinyl behind low synth and the first melancholic notes of the piano submerging you into a timeless, comforting dreamlike void. The band stress in their bio that the album name was not satirical, but a description of their creation; no awards in which case for what new features the release contains. Piano and Xylophone add a melodic dynamic that subtly oxidizes the suffocating black numbness that runs entirely through the likes of ‘Black Earth’, allegedly what the likes of this material reverts to. The sinister intention in the back ground remains present like a slow poison, though occasionally the piano and synthesizers drift out of the dark and a more ethereal floating feel dominates the atmosphere. The most satisfying incidents during these passages are when lighter notes flittering content on the breeze are given a malicious edge with low minor piano resonance, reminding you briefly that this isn’t “nice”. As the album progressed I started to get a feeling that something was lacking in Bohren‘s sound which was un-doubtable the throaty warmth of the saxophone, the lacking of which started to piss me off until it made a satisfying re-appearance just over the halfway line. While Piano slicing into the various haunted soundscapes created on ‘Piano Nights’ isn’t without atmosphere, It doesn’t have the trademark emotive quality that the saxophone does, and as a result of both musical direction and choice of instrument, that airless darkness is aired out to some extent, like the exhausted feeling of coming down at 6 in the morning and becoming aware of the sunlight spilling through the window. 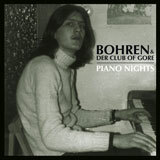 Much of the time, a sound truer to conventional jazz is slightly more prevalent, and while this comes with its own merits, it isn’t the sound of slow suffocating darkness that drew me to Bohren & Der Club Of Gore in the first place. It wouldn’t be right to condemn a band for exploring new avenues in their sound and asking for exactly the same feel as another record, and while changes are noticeable, it is still beyond any doubt who you are listening to even in the most parallel moments. As the sound reaches the pinnacle of its exploration through the middle of the album, towards the end is a submergence into more satisfying and familiar darkened territory, with track eight ‘Verloren’, capturing some excellent moody tones that flow into the last track and the apex of the album, like the transition of sunset to blackness. It should be noted that to experience this album to its full potential, there must be none of the duties associated with daylight necessary. They metaphorically liken the experience to “Sailing without wind;” for which ideally, you would be stoned, prone and only conscious in the strictest sense of the word. In this state the in-consequential passages won’t find you losing patience, of which you shouldn’t be consciously keeping yet is essential in abundance subliminally. You will be free to experience the subtlety and let it “Wash over you”, like time has stood still in the way Bohren & Der Club Of Gore intended.